At Last,..the TRUTH is revealed! 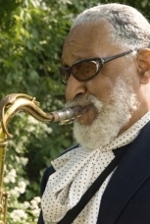 Master Sonny has summed up just about everything I’ve heard,read,and tried to write about Jazz,..the bottom line,. relating the music and those who engage it to LIFE,..
MAD props to Sonny and Jason..
Newk is my absolute inspiration and hero. How relevant is music today to the american audience is indeed a larger question. Most of these last couple genrations expect to download it for free and do so. Is it more prevalent or less so in the the schools? Most I know say the whole ” music literacy” is down. Fewer radio stations play jazz than ever and barely any TV now. perhaps Youtube is filling that gap but there is no revenue being genrated for artists. The audience at festivals is the same people for the last 20 years hence the average age is now 40-50. And while jazz will always exist in basements and clubs here and there, will it ever return to a level enjoyed in the 60s or earlier?